The U.S. Fourth Cavalry, under the command of Gen. Ranald S. Mackenzie, spent 1872 exploring the unmapped Llano Estacado in search of Comanche chief Quanah Parker and other bands of marauding Comanches who refused all invitations to the reservations. General William T. Sherman sent General Ranald S. Mackenzie and the U.S. Fourth Cavalry into the heart of Comancheria on a seek-and-destroy mission in December of 1871. Mackenzie's troops spent the next year looking for Comanches on the vast, level expanse of the Llano Estacado, which appeared as unbroken as the sea, but with a series of canyons and gullies deep enough to hide entire ecosystems and provided things the plains did not, including refuge. Some people said there was a trail across the Llanos, but since most non-Comanches who ventured onto the forbidden plains ended up dead, Mackenzie had no way of knowing if such a trail existed or where to find it if it did. An 1857 map shows the trail stretching from Mexico and across the Llano Estacado, where it branched into two trails. One branch went up the Yellow House Canyon to Buffalo Springs and what is now Mackenzie State Recreation Area in Lubbock. From there, it extended to the Double Mountain Fork of the Brazos and eventually to New Mexico. The second route branched off to Blanco Canyon, and from there to Running Water Draw, past present-day Plainview and Muleshoe. 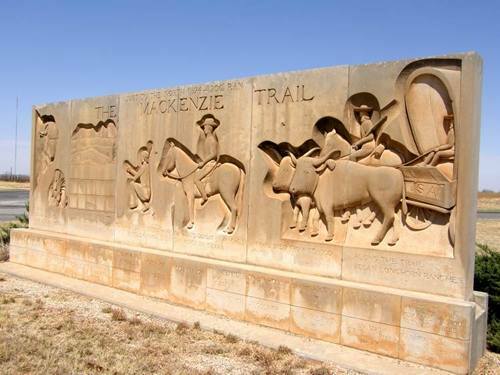 Mackenzie no doubt knew of the Comancheros, a group of New Mexico natives who ran cattle from Texas to New Mexico, legally and otherwise, and who traded extensively with the Comanches. They had to have a trail to follow into Comancheria. But where was it? A captured Comanchero named Polonio Ortiz provided the answer. He told Mackenzie of a wagon trail with water and grass that ran east-west across the plains. Ortiz hired on as a scout, just in case he was telling the truth. Mackenzie crossed the Llano Estacado twice, by different routes, in the summer of 1872. In July, Ortiz and some other scouts found the trail. The trail opened a road into a vast area that the Comanches had ruled as a "no survival zone" for centuries. If Mackenzie hadn't defeated the Comanches, another general would have. But Mackenzie did half the work, just by finding how to get to where they were. A number of towns have claimed portions of the Mackenzie Trail as their own, and most of them probably have a right to do so. Aside from the main trail, the Army established other routes as dictated by destination. Quartermaster Henry Lawton established one such trail from Fort Concho to Blanco Canyon. By 1900 railroads had obliterated much of the Mackenzie Trail and made it mostly unnecessary. The railroads were the new trails, and some of them followed Mackenzie's route. The best of what's left of the Mackenzie Trail today is probably on private property. You're near it when you're at the intersection of U.S. 277 and Texas 6 in Stamford, where a monument tells you the trail ran a little north of there. The trail also ran between Dickens and Spur, so when you're on parts of U.S. Highway 82 from Dickens to Lubbock you're probably following Mackenzie's path pretty closely. Historian Ernest Wallace noted in his account of Mackenzie on the plains that Mackenzie's trail was a highly significant contribution to the exploration and opening of the American West. 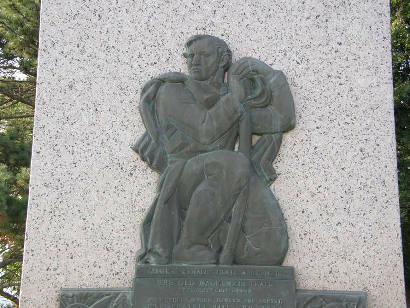 Mackenzie, he wrote, "found two routes across the treacherous plains. The discovery of the roads and good water would make it possible to keep the hostile Indians constantly on the run until they surrendered, or all be surprised and captured or killed."